Home Vintage Cast Iron Cookware Vintage cast iron. How to identify Sidney Hollowware cast iron. How to identify Sidney Hollowware Cast iron. Sidney Hollowware Co, has to be one of my favourite companies that made cast-iron cookware. The cookware made by Sidney Hollowware Co, tends to have very few molding imperfections, smooth both on the interior and the exterior, just like the Favorite Piqua Ware, Erie and Wagner Ware. Sidney Hollowware made ironware in a time it was cast lighter. It must have been standard practice to cast iron thinner back then. So Sidney skillets are great if your looking for a lighter pan but without the price of an early Wagner cast iron skillet or Griswold skillet. If you have any Sidney Hollowware cast iron, then your’e lucky, they only manufactured cookware between 1888-1887. Sidney Hollow Ware Co. had their foundry based in Sidney Ohio and only made cast iron cookware between 1888-1897. I’d reckon you’re lucky if you have old an old Sidney Hollowware skillet in your possession. 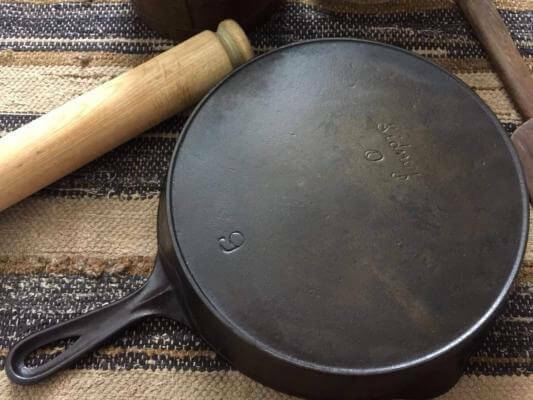 There aren’t too many of old Sidney skillets around. They’re a lot more scare than Wagner and Griswold cast iron and rarely come up on online auction sites, so eye out for them. We also have an interesting article find you want to learn more about the history of the Sidney Hollowware Co “here”. Each piece made by Sidney Hollowware had either one of two logos. However both of the logos have an old world charm from a bygone era. They really look great. 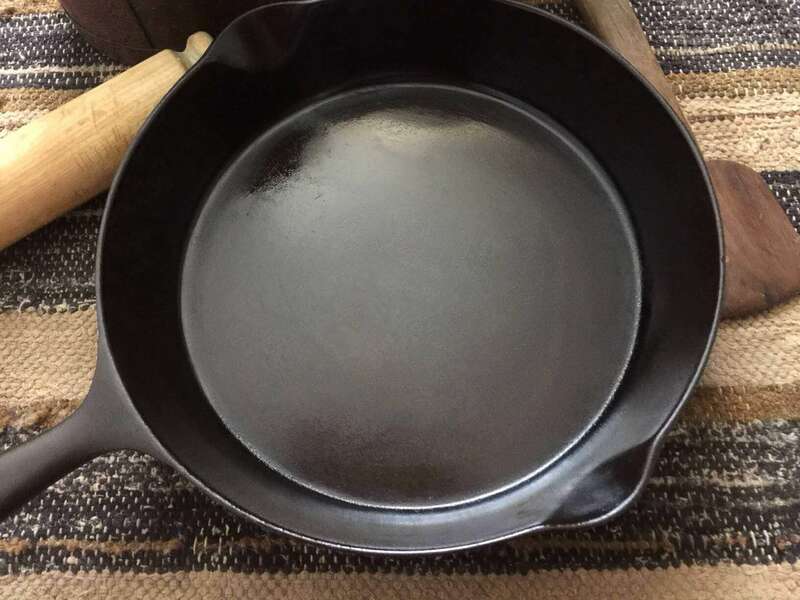 If you’re looking for a vintage pan, these old timers are really good looking. Do your research, you may come across the use of three names “Sidney Hollowware” “Sidney Hollow Ware” and “Sidney”. Are they different makers? 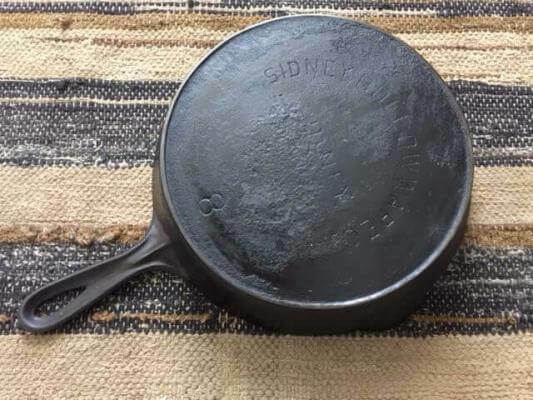 It seems confusing but it looks like both Sidney Hollowware and Sidney Hollow Ware are used interchangeably these days to identify Sidney cast-iron. 1. Sidney O logo script lettering. The script logo is considered the older of the two logos. This logo is quite beautiful and also simple. This logo is embossed with the word “Sidney” followed by “0 for Ohio and the lettering is in a linked up script style. 2. The Sidney Hollowware Co, logo (block printing lettering). The second the block logo while has the full company name which was either centrally straight or in an arc shape. Both had Sidney the 0 place in middle. This logo has an “Old West” look to it. With these two logos there are slight variations. The second logo will be clearly identified as Sidney Hollowware. If you have or looking at a piece of cast-iron only with the word “Sidney” then it’s not as clear cut to identify. “Script Sidney” logo and the “block Sidney” (printing style) Logo. If you see a see a Sidney skillet it will more than likely one of two styles. One with a fancy script the other with block lettering in either an arc across the top or centered across the middle. To the best of our knowledge the script logo is considered to be made by the Sidney Hollowware Co, while the other is considered to made under the ownership of Wagner Ware which bought out Sidney Hollowware Co, in 1897 If you’re looking for a true Sidney Hollowware piece then look for the script logo. Look for the Sidney logo written in script to identify the cast-iron made by Sidney Hollow Ware Co. Some more terms used you may come across. “Pre Wagner” and “made by Wagner”. Online Sidney cast iron maybe described as “Pre Wanger” or “Made by Wagner.” This is really referring to the different writing styles stamped on the cast iron mentioned above. This is to correctly identify Sidney cast-iron according to cast iron enthusiasts or collectors. Remember it is thought iron cookware made by the Sidney Hollowware Co, had the script logo and was made under the ownership of Phillip Smith. While the block printed style is thought to have been cast under the ownership of Wagner. If you want to buy a piece of Sidney cast iron please check the logo carefully before deciding to purchase. Understandably those selling one or two pieces of cast iron may label it incorrectly. Is Sidney Hollowware ware collectable? While people value Wagner cast iron and Griswold cast iron more highly for their collectability, Sidney Hollowware is still very collectable also pieces are harder to come by. Sidney Hollowware made some really nice iron which will do you very proud. Sidney Hollow Ware Co, made lovely pieces of cookware with very smooth cooking surfaces under the leadership of Phillip Smith The logos also have that old world wow factor that look wonderful. We really enjoy our Sidney skillets. 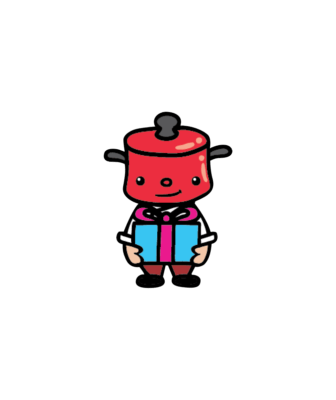 You might want to consider Sidney Hollowware only manufactured cookware from 1888-1897. So while Griswold and Wagner maybe more more well known as quality vintage iron and there is a lot more iron around. Sidney Hollowware on the other hand would is more scarce and less information documented on the company. 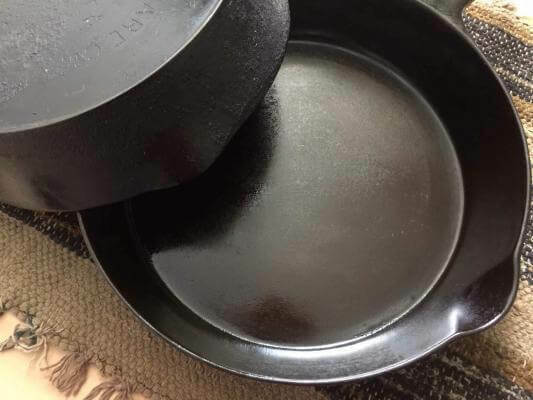 Is Sidney Hollowware cast iron any good? Sidney Hollow Ware seemed to cast their iron very well. With very smooth cooking surfaces and exteriors. The iron made is lighter than today’s cast-iron cookware. 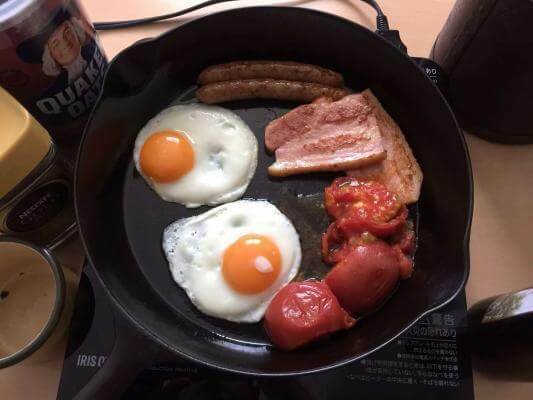 How light are Sidney skillets? Well, like many of the vintage cast-iron manufactures there is a noticeable difference with cast-iron cookware made today. However vintage cast iron may have imperfections from piece to piece so they have lots of character. Wapak Hollow Ware tends to have more casting flaws. However those characteristics are what really make vintage cast iron fascinating. Things to consider with Sidney cast iron. Check the logo carefully before you buy. 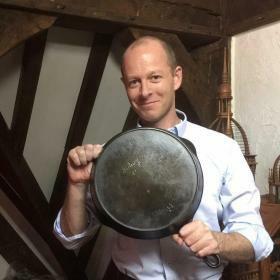 Older pans such as Sidney Hollowware are lighter than other iron. Lighter pans are more prone to warping and the iron may rock or wobble on a flat surface. Thin pans can warp easily. Preheat your skillet on a lower temperature first. Check to see or the if the iron sits flat. Ask if there is any movement when pressing down on the edges. Is the iron shiny? Many Sidney Hollow Ware pieces maybe plated with chrome. We have tried our best to research and to give accurate information. The guide is to the best of our knowledge. We are no-means experts in the field of cast iron but rather a keen hobbyist. However as an owner of a small collection of cast iron we can say that Sidney Hollowware is incredible cast-iron. Many of which are still usable today as they were all those years ago. If you come across a piece for sale it may pay to take a second look if you’re thinking about selling a family heirloom I’d think about keeping it in the family you don’t come across these old pieces everyday. 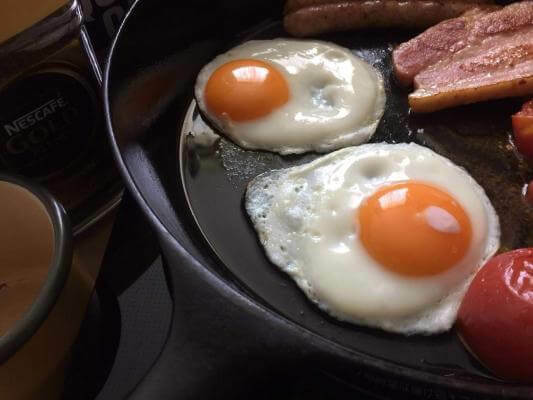 Previous articleLearn about the benefits of enameled cast iron cookware. Next articleWapak Hollow Ware Co. Find out more about Wapak cast iron.